From home: is it fabulous? Amazing? I realize I am evasive, resistant in my answer. Oh, ebbing and flowing, like the sea. Arriving in the city of summer, a suitcase of books in tow, expectant of sea, expectant of myself filled up with boxed-up wintertime project. I’ve been all month to Meena’s weekly assignments. Tiny diaries and sketches of our wanderings. Aubade, poem written at dawn, after parting with lover. In the night, 3:15am experiment. The first night, notebook pried open, cell phone alarm clock by the bed, expectant. Don’t bother turning on the light, scratching heavy lines from dreams. In the morning, the page empty, still waiting. T tags me in a Facebook note: I did it! I liked thinking of you doing, it too! But I am not doing it. Where is the raw story in my throat stubborn. The truth is: to live across from ocean, the furious waters, what is left behind by receding tide. Walking to Norman Mailer’s house through warm and seaweed waters. Wading in the tidewater flat. Watching for whales. On a bike, remembering how it feels to fly after ten years. All beautiful distractions. Sitting with myself, the practice of it, and nowhere to hide. Even after sitting through the sunrise, what are you putting down of yourself. The truth is: guilty, guilty and more so, when the day departs. 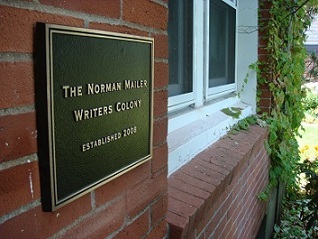 Watch a Youtube video of Norman Mailer nasty with Gore Vidal. Research. And then a book about a woman murdered years ago in Truro. A journalist names this Cape Cod confessional. Talk to an artist about a recent newspaper article about Asians overfishing squid and why do Asians need to be named. Research. Will I write about the Asians and the squids. In the midst of settling into the self, Sikh temple shooting, Wisconsin weeps, and I wish I wish I could be with, amidst, amongst community. Sending a note out and away. The truth is: distraction rises to the surface, away from my regular life. What stops me from writing there, except by coercion and community, is what keeps me from writing here. Contending with my own creatures. When I have the space to unfurl, what arrives old friends. The same writing question: how am I going to love my mutant/monster self. And the daily process, practice of answer. Ching-In Chen is the author of The Heart’s Traffic (Arktoi Books/Red Hen Press) and a co-editor of The Revolution Starts at Home: Confronting Intimate Violence Within Activist Communities (South End Press). They are a Kundiman and Lambda Fellow and a member of the Voices of Our Nations Arts Foundation and Macondo writing communities. A community organizer, they have worked in the Asian American communities of San Francisco, Oakland, Riverside and Boston. In Milwaukee, they are Cream City Review’s editor-in-chief and involved in their union and the radical marching band, Milwaukee Molotov Marchers. Ching-In is also a Mailer Poetry Fellow, using the month of residency to work on Dialektik Skool, a book re-writing the global history of coolies.